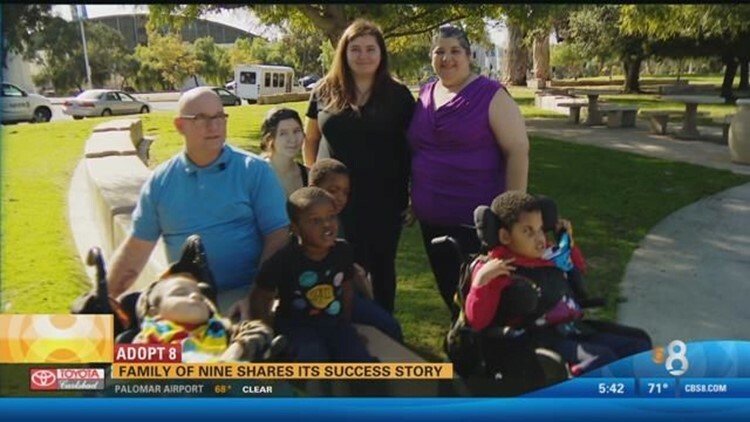 SAN DIEGO (CBS) - An Adopt 8 story we featured nine years ago changed a local family's life forever. A baby boy named Jeremiah prompted the family to start the adoption process and as you'll see in tonight's Adopt 8 success story the expansion of their family didn't end there. Once a family of five, with two daughters and a son, they are now a family of nine. “My oldest daughter Rachel and Honey. Jeremiah's next, Ezekial, Ernest and Obediah, our oldest son Timothy could not be here today. He's actually at work,” said James. It was back in 2007, when James and Laura were inspired to adopt by an Adopt 8 story, featuring a medically fragile baby named Jeremiah, who has hydrocephalus, which is water on the brain. James and Laura believed his name was a sign that he belonged with them. “My wife was singing this song for many months and the song was Jermiah was a Bullfrog,” continued James. They immediately started the process to become Jeremiah's forever family. And they didn't stop at one. In 2011, they saw Ernest on Adopt 8 and made him part of their family. Next came Ezekiel and then Obadiah. “I want children to have a safe place. I want them to have a mom and dad and they deserve it. The circumstances that bring them into the county, it's not their fault, and people need to know these are children that have done nothing wrong and they need, they deserve to have somebody to step up for them, and love them and be the proper parent that they need to be,” said Laura. The couple's 19-year-old daughter Rachel, says she will also adopt one day. “I think it's great, they've changed our lives and it's just awesome to have more siblings,” she said. Honey, 17, says her younger siblings have changed their lives for the better and have made her so appreciative of her parents.